Paste the door hanger on heavy paper, and cut it out. On the rock, write something you will do to strengthen your family. 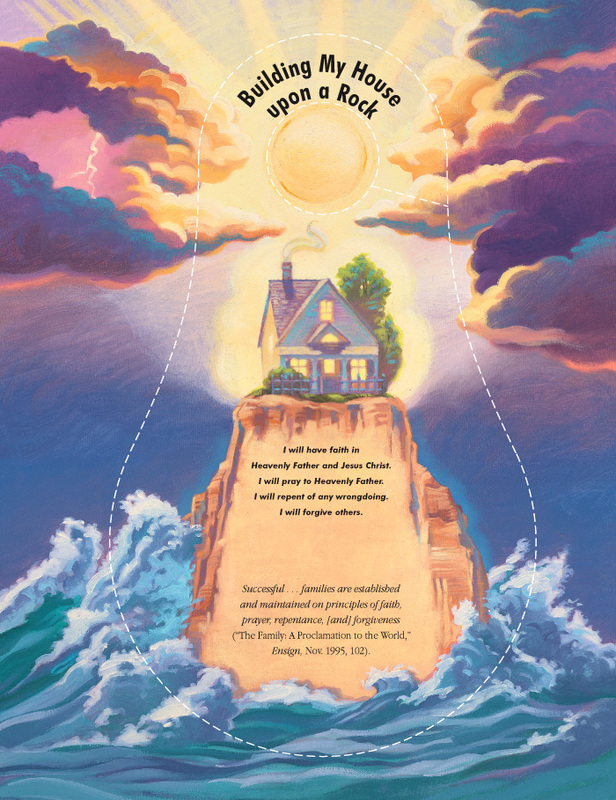 Hang it on a doorknob to remind you of what you can do to build your house upon a rock. “Successful … families are established and maintained on principles of faith, prayer, repentance, [and] forgiveness” (“The Family: A Proclamation to the World,” Liahona, Oct. 1998, 24; Ensign, Nov. 1995, 102). Have you ever built a house out of sand? Did you watch the waves wash it away? If you were building a house to live in, you wouldn’t build it on sand. You would want to build your house on a solid foundation—perhaps of concrete or rock. 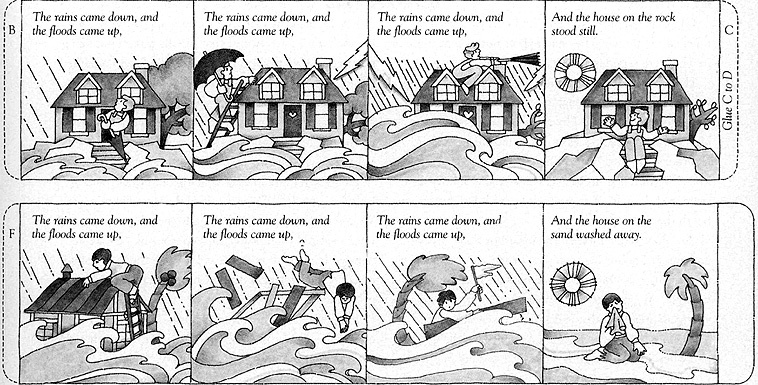 Then if the rain came down, a flood started, or the wind blew, your house would be safe. 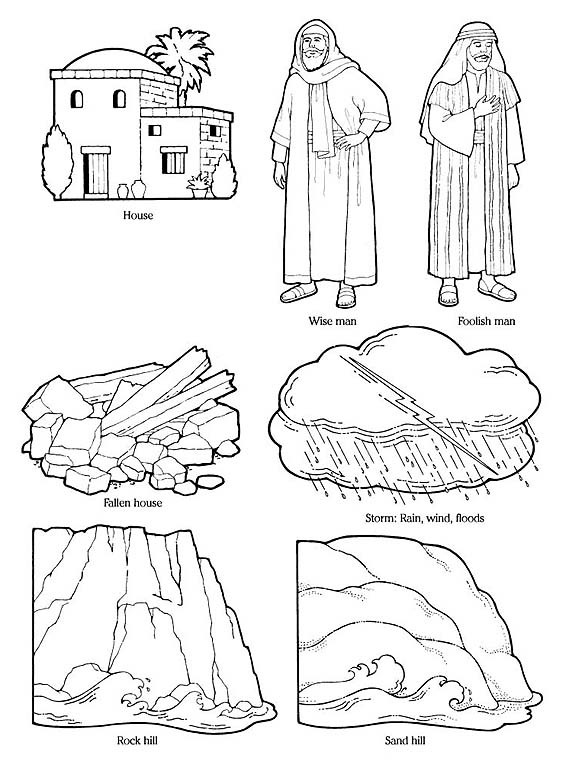 Jesus explained: “Therefore, whoso heareth these sayings of mine and doeth them, I will liken him unto a wise man, who built his house upon a rock—and the rain descended, and the floods came, and the winds blew, and beat upon that house; and it fell not, for it was founded upon a rock” (3 Ne. 14:24–25). That rock is the gospel of Jesus Christ. When Nathan was five years old, he suffered an eye injury. During the next few years, Nathan needed several operations. Nathan and his family prayed and had faith that he wouldn’t lose his sight. Heavenly Father heard their prayers and blessed Nathan so he could see. Like Nathan, you will have challenges. These are like the floods, rain, and wind that can come down upon your house. When you say your prayers, have faith, and live the teachings of Jesus, you will help strengthen yourself and your family. You will be building your testimony upon the rock of the gospel of Jesus Christ. Building My House upon a Rock I will have faith in Heavenly Father and Jesus Christ. I will pray to Heavenly Father. I will repent of any wrongdoing. I will forgive others. 1.Write “Prayer Strengthens Me and My Family” on the board. Display a piece of paper and a book. Explain that the book represents challenges; the paper represents us. Invite a child to stand the paper on its edge and balance the book on top. After a few children have tried it, explain that there is a way to make the paper strong enough to hold the book. Roll the paper into a tube, and secure it. Stand the paper tube on its end. Carefully place the book on top (practice beforehand). Similarly, when we pray and keep the commandments, Heavenly Father will shape our character and give us strength. Invite two or three families to share how prayer has strengthened and blessed them. Have each family share a favorite song or hymn and sing it together or with the Primary. 2.Act out the parable of the unforgiving servant (see Matt. 18:23–35). Point out that the debts were as if the servant would not forgive a debt of U.S. $1 after the king had forgiven him a debt of $600,000 (see James E. Talmage, Jesus the Christ, 3rd ed. , 396–7). Prepare seven large question marks with the following questions, and place them underneath every seventh chair: 1. Whom does the king represent? (Our Heavenly Father.) 2. Whom does the unmerciful servant represent? (Each of us.) 3. Whom does the fellow servant represent? (Anyone who has offended us.) 4. What is Jesus teaching us in this parable? (That we must forgive others if we want God to forgive us.) 5. How do you feel when you forgive someone? 6. How do you feel when you do not forgive? 7. How do you feel when Heavenly Father forgives you? Have the children count off. When they reach seven, ask the child to look under his or her chair and answer the question. Continue until all the questions have been answered. Read Matt. 18:21–22. Have the children multiply 70 times 7. Jesus was teaching us that we should always be willing to forgive. Encourage the children to memorize D&C 64:10. Sing a song or hymn about forgiveness. Faith, if it hath not works, is dead. … I will shew thee my faith by my works. (James 2:17–18). While He was in Galilee, Jesus Christ gave the Sermon on the Mount. * In it, he taught His disciples the Beatitudes and to be a good example to the world. He taught them that it was wrong to be angry with or hate anyone, even their enemies. Not only should His disciples do what is right, but their thoughts should be righteous, too. He taught the principles of prayer, forgiveness, and seeking “first the kingdom of God, and his righteousness” (Matt. 6:33). “And the rain descended, and the floods came, and the winds blew, and beat upon that house; and it fell not: for it was founded upon a rock. We have many opportunities to learn the gospel of Jesus Christ. We can show that we have faith that the gospel is true by choosing the right each day. If we do, we will be like the wise man—building our lives upon the solid foundation of the gospel and preparing ourselves to live again with Heavenly Father and Jesus Christ. Color the flannel-board figures, then mount them on heavy paper. Cut them out and use them to retell the story of the wise man and the foolish man. And this is life eternal, that they might know thee the only true God, and Jesus Christ, whom thou hast sent (John 17:3). Have you ever gone to the seashore and built a house out of sand? It’s fun to mold and shape, but sooner or later, the waves creep closer and wash it away. If you were going to build a real house, you would want to build it on a firm foundation of rock or concrete so that when the wind, rain, or floods came, the house would be secure and you would be safe. Many times in the scriptures, gaining a testimony is compared with building a house upon a rock. A testimony’s foundation is the gospel of Jesus Christ. In Doctrine and Covenants 11:24, the Lord says: “Build upon my rock, which is my gospel.” [D&C 11:24] To build your testimony upon the rock of the gospel, you must believe in Jesus Christ, repent, be baptized, and receive the Holy Ghost. You should also pray always, attend church, take the sacrament, and keep the commandments. (See 3 Ne. 11:38–40; 3 Ne. 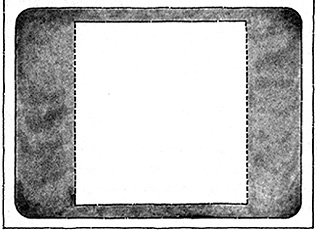 18:1–15.) Then you will be strong and choose the right. We all have experiences that test us. These are like the rains, floods, and storms that can beat upon a house. If you have not built your testimony upon the rock of the gospel, when problems or temptations come, you might decide to quit trying to resist temptation, and, like a house built upon the sand, your testimony might fall. “And the rain descended, and the floods came, and the winds blew, and beat upon that house; and it fell not, for it was founded upon a rock. And the house on the rock stood still. And the house on the sand washed away. 1.Have children tell experiences about how their testimonies have helped them choose the right. They could record them in a journal or draw a picture about them. Some events could be acted out. 2.Demonstrate how a house on a rock remains standing. Make two simple houses out of lightweight cardboard. 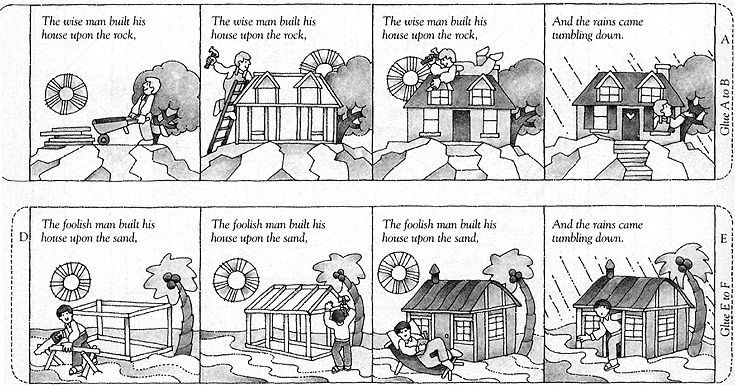 In a large pan, put one house on a pile of sand and securely tape the other house to a rock. Pour a “floor” of water into the pan and show that the water will wash away the sand, but that the house on the rock will be safe. 3.Label rocks or building blocks with ways to build your testimony. Discuss why each is important. Filed under: Lesson 12: The House Built on a Rock, Sharing Time, Build upon my rock, Lesson 12: The House Built on a Rock, Sharing Time: Build upon My Rock, which is my gospel.